Brownies are great all by themselves, but when you add ice cream to the already perfect taste, something truly special happens. 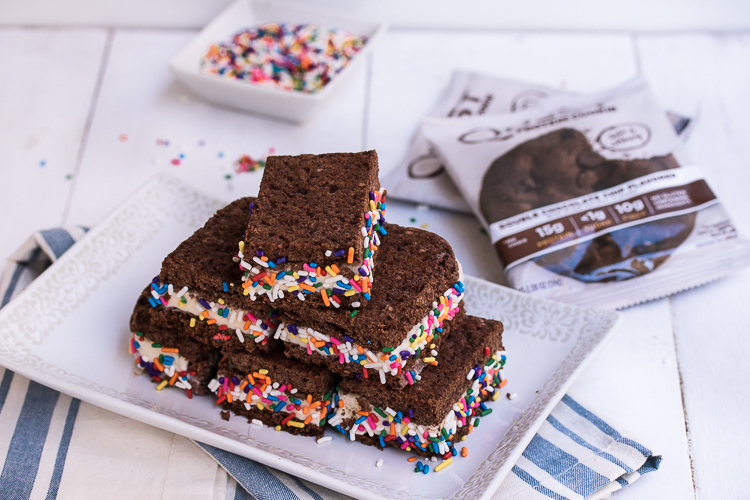 Get ready to enjoy the mouth-watering indulgence of a high protein Brownie Ice Cream Sandwich! Preheat oven to 350 F and prepare (2) 6-inch square pans with parchment paper. Place the cookie into a food processor or nutribullet and blend until fine crumbles form. Transfer to a mixing bowl and add in the remaining dry ingredients (protein, Truvia, oat flour, cocoa powder, baking powder and salt) and stir until combined. Add in the egg, butter and vanilla and mix using a handheld mixer until a dough forms. Separate the dough into two evenly sized pieces and press them evenly inside the pans. Bake for 6-8 minutes. Remove and let cool completely. Take the remaining brownie out of the pan and set it upside down over the ice cream. Cover and freeze for at least 4 hours before cutting into 6 slices, dipping in sprinkles and serving. Written by: Levi Harris on August 2, 2018.